This month sees the publication of member Peggy Ehrhart’s sequel in her blues mystery series. 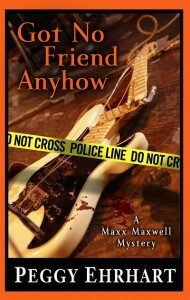 In the new release, GOT NO FRIEND ANYHOW, Maxx Maxwell, the hardest-working and unluckiest singer on Manhattan’s blues scene encounters more deadly complications when she tries to get her band’s demo CD recorded at Prowling Rooster Records. Congratulations, Peggy, on adding to Maxx’s troubles for our entertainment! This entry was posted on February 26, 2011 by nysinc. It was filed under Member News .